This is Viktor. He’s a Victorinox Sorbonne backpack. I met Viktor at Bratpack. I had just made the decision to go backpacking in Thailand, and I was antsy to start my preparations for the trip. I thought buying a backpack would be a great start. I chose Victorinox because it’s a brand you hardly see people toting. I’m weird like that. I believe I made a good choice; Viktor and I get along splendidly. He’s named not after the brand, but after Viktor Krum. Really. He went with me the first time I traveled alone to Cebu, then went on to join me in Singapore, and on to my first overseas solo travel in Thailand. He also went with me to Bohol. I didn’t bring him with me when I went to Melbourne, but he followed me soon after, accompanying me to Sydney and the Gold Coast. On my second trip to Australia, I made sure I brought him with me when I flew out of the Philippines. Viktor was with me and my sister’s family when we went to Ballarat, through the Grampians and Horsham. He even went with us to Tasmania. When I decided to stay put in the Philippines this 2008, Viktor supported my decision, joining me in exploring Donsol, Coron, Cebu and Davao. He will join me again in my upcoming trips before the year ends. That is our story. What is yours? Share the unique experiences you’ve had with your bags and get a chance to win a Hedgren, Timbuktu or Jansport bag from Bratpack. Tell us about the places you’ve been to together, or how it helps you express your individuality. Contestants must write about their stories in their respective blogs. Be elaborate and give us details; plus points if you include pictures in your entry. Comment here or send a trackback so I’d know that you entered the contest. Your comment or trackback must be in before 11:59pm of November 14, 2008. Of course, entries must be written and completed before then. No comment or trackback disqualifies your entry. The winning entry will be announced on November 19, 2008. This contest is sponsored by Bratpack. Yes you are very right when yoou say that it’s a brand you hardly come across. Have to say its a good choice. There are two experiences in my life that have been significant when talking about using Jansport bag. The first one was back when I was 12 when my parents had a really big fight. The tension was so intense that my mother and I had to pack our things and move out of the house for a while with my little brother. 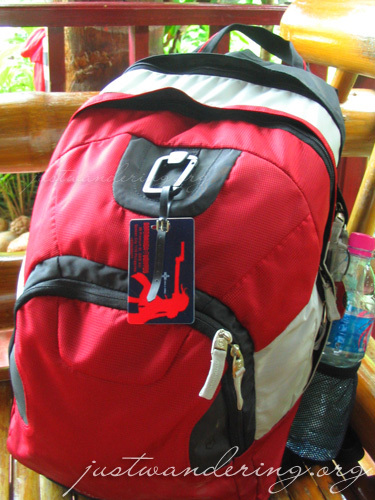 I remember using my classic red-maroon Jansport bag on our way to my lola’s house in Laguna. During the trip I was crying on one side of that bag while holding it. That’s why I was so surprised with this contest because that moment that I mentioned is something that I can’t forget. The other story was when the first time that I was permitted to sleep overnight with my friends. That was when I was already a 4th year college student. Just imagine all those overnights that I missed before that day. I was really excited. It was an overnight swimming in Pansol with my college barkada. And of course, the bag that I was using was a black Jansport bag. I super love my Jansport backpacks!